Moray Business Women’s Club has been recognised at national level in a glittering award ceremony. The Club was crowned Best Affiliated Group of the Year at the 2017 National Business Awards. 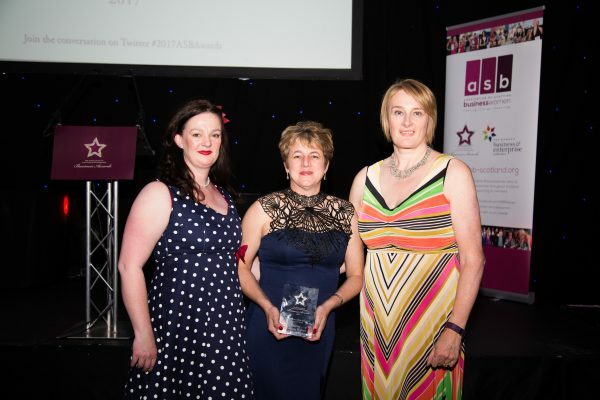 The awards are run by the Association of Scottish Businesswomen (ASB) and recognise the talents and reward the achievements and contribution of women in business throughout Scotland. The ceremony was held at Glasgow Grand Central Hotel and was attended by 230 guests. Open to business and professional women across Scotland, the ASB National Business Awards showcase and celebrate the achievement of women working across all sectors. ASB President, Wendy Maltman, said: “We are so incredibly proud to play an integral role in shining a spotlight on the many successful and inspiring women in our business communities by facilitating the awards and giving the opportunity to praise and reward the most talented women for their achievements in business and in the community, recognising their hard work and dedication. Next month Moray Business Women’s Club will hold its own annual award ceremony and ball which will be held to raise money for its 2017 charity Moray Foodbank. The event will be held in the Eight Acres Hotel in Elgin and the organisers are keen to hear from any businesses who would like to sponsor the event or offer auction and raffle prizes.